With ‘a painting revealed’ I’ll show you how a painting is created. Stage 1: transferring the sketch/composition onto the gessoed linen. I paint the outlines with acrylic. Stage 2: the imprimatura (Italian for ‘first paint layer’), is a transparent layer that provides an overall tonal optical unity in the painting. Eventually this ground color will shine through glazing paint layers, mostly the dark and midtones. Of course the outlines of the sketch are still visible. I use umber, a little boneblack and lead carbonate for this layer. It is painted with a big soft mottler in one direction. This is a very thin layer and quite lean. 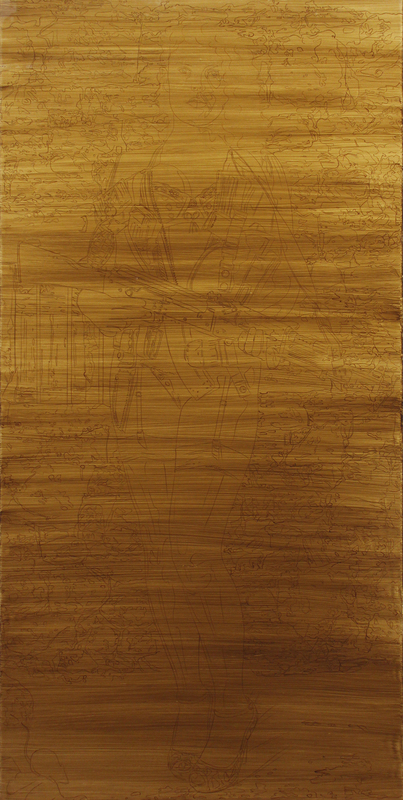 After two weeks of thorough drying, the underpainting can be applied. Step 3: the underpainting (dead coloring) is a monochrome version of the final painting intended to initially fix the composition, give volume and substance to the forms, and distribute darks and lights in order to create the effect of illumination. The grey tones that are created and the lack of color, referring to dead flesh and explains the term ‘dead paint’. I used the colors: lead white and raw umber. The flesh of the model is painted in two layers to get a smooth and more grayish tone. This will help to create a silky skin with gray, green and blue tones in the next (semi)transparent layers. The imprimatura is still visible, mainly in the darker parts. Step 4 & 5: applying color to the painting. Now that I have completed the underpainting I begin building up the colors. I paint this with a medium that consists more oil relative to the medium for the underpainting. It’s a principle of painting in layers; ‘fat over lean’ will reduce the risk of oil paint cracking when it dries. I apply color in ‘semi’ transparent layers using the underpaint as midtones (painting these areas with transparent local colors). For example: by using the underlayer it creates optical grey, blue and green tones in the flesh of the model and gives the grey wall a warm overall glow. When this fourth layer is completed I add another (fifth) layer to give the paint more ‘body’ and to adjust contrast. Step 6: glazing. I finish the painting with glazing parts that I’d like to catch the eye. I glaze almost everything except for the background, although I do glaze dark backgrounds because the subject must looming from it. The glaze helps smoothen transitions of paint. The lightest areas I paint with less medium, so the paint becomes thick, which is necessary to catch light. In this painting I glazed the model and her equipment en the foreground. These things I wanted to stand out from the background. The glazing gives the paint more richness and depth. The light goes trough all the layers to the white ground and reflecting back into your eye. You can’t reach the same effect with one thick layer of paint. This technique is what oil painting is about. I think we have to cherishing this technique.